One of the early bands to be labeled "psychedelic", the Electric Prunes hit #11 on the Billboard Chart with their late-1966 smash 'I Had Too Much To Dream (Last Night)'. Their outlandish moniker became somewhat of a blueprint for similarly named bands of the era (Ultimate Spinach, Strawberry Alarm Clock, etc.). Their sound is sometimes categorized as garage/punk, but most definitely also qualifies as psychedelic with the group's inventive use of the Vox Wah-Wah pedal and their fusion of classical music with progressive rock. The original band's lineup consisted of James Lowe (vocals, autoharp), Ken Williams (guitar), Mark Tulin (bass), James "Weasel" Spagnola (guitar), and Preston Ritter (drums). In 1966, as a band practiced feverishly in a garage in Woodland Hills, CA, a passing stranger asked if she could come in and listen. After a few numbers, she mentioned that she knew a staff engineer at RCA named Dave Hassinger who had been working with the Rolling Stones and was looking for his own group to produce and would they be interested in such a venture. With most bands willing to die for such a break, they eagerly agreed to meet Hassinger who heard them, recorded some demos and then promptly got them signed to Reprise Records, a subsidiary of Warner Bros. Hassinger secured a job there as staff producer for himself through this deal. "What's purple and goes buzz buzz? - An electric prune!" After much laughter, Lowe presented the name to Hassinger who hated it! Because of its negative reception, two alternates were also drummed up to present to the record company, but when Hassinger hesitantly told them the name "Electric Prunes", they loved it! The Prunes' debut single, 'Ain't It Hard', made little impact, but their follow up, the Annette Tucker and Nancie Mantz composition 'I Had Too Much Too Dream (Last Night)', proved to be a winner as it raced up the singles charts, almost cracking into the top 10. Their accompanying self-titled debut LP contains several more Tucker/Mantz originals, which was an effort to capitalize on the single's success. One of those songs on the album that was also their third single ('Get Me To The World On Time') also became a hit, reaching a respectable #27 on the charts. 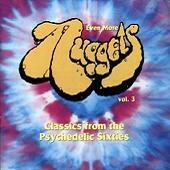 Their second LP titled 'Underground' was released in the late summer of 1967. 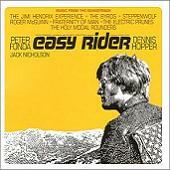 Halfway through its recording, Ritter left and was replaced by Mike "Quint" Weakley (drums). The album is comprised of a greater number of original songs composed by band members and is considered by many to be the most representative of the group's signature sound. The band emanates an aura of confidence, stretching out on songs like 'Children Of Rain' and 'The Great Banana Hoax'. Another stand-out track on the record is the Goffin/King penned 'I Happen To Love You', which features snarling vocals from Lowe, and a unique Vox organ guitar solo. Despite the solid performance on 'Underground', sales were less than expected and none of the singles released from the album became a hit. After the unfortunate mediocre reception of 'Underground', Spagnola left the band and was replaced by Mike Gannon (guitar). In an attempt to return to the charts, arranger David Axelrod was brought in with the idea of combining classical music with freak-out psychedelia. The result was the very non-commercial LP 'Mass In F Minor', which was a far cry from the groups prior material and was sung entirely in Latin. This bold change in direction proved to be an over ambitious move for the group and kept them from building on the solid performance of their previous album. During the recording of "Mass", progress in the studio wasn't moving as quickly as some wanted so Hassinger brought in the guitar player of the Canadian group the Collectors, along with Don Randi on organ and Richie Podolar playing additional guitar, to help finish the project. The result is a disjointed mix of classical music and rock that never really jells well. Making matters worse, a live performance of "Mass" was hastily arranged and only allowed for one group rehearsal before playing it on stage. The performance proved to be a disaster. 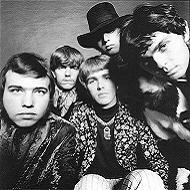 Frustrated with the direction the band was headed in, James Lowe split in mid 1968. Kenny Loggins reportedly joined the band briefly around this time, playing with them in concert for a few shows, but never recording in the studio. All other original members soon followed Lowe's lead and left the band a few months later. 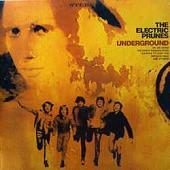 Hassinger and Axelrod carried-on the Electric Prunes name with a late-1968 LP using studio musicians. 'Release Of An Oath (The Kol Nidre)' was of similar sound to "Mass" and was based on the prayer 'Kol Nidre'. This effort is more cohesive than its predecessor and contains some solid acid guitar, most notably on the outstanding 'General Confession'. In 1969, the seminal hippie film 'Easy Rider' was released and became a huge hit, achieving critical acclaim in the United States and abroad. The Prunes song 'Kyrie Eleison' (culled from 'Mass In F Minor') was featured prominently in the movie and kept the band relevant due to the excellent sales of its accompanying soundtrack. At the close of the 60s, with Hassinger still using the group name, he arranged for another ensemble of studio musicians to record a final LP titled 'Just Good Old Rock And Roll', which returned the Prunes to a more basic rock sound. The accompanying and excellent single 'Hey Mr. President' b/w 'Flowing Smoothly' unfortunately did little to extend the life of the group and they quietly disbanded in 1970. In 2001, three of the original members (Lowe, Tulin and Williams) got back together and reformed the Electric Prunes, releasing three acclaimed LPs since. They also still tour the U.S. and Europe to rave revues, so be sure to check them out when they hit your town! A big thanks to James Lowe of the Electric Prunes for his important contribution to this article.